Blackheath is an area of south-east London, divided between the Royal Borough of Greenwich and the London Borough of Lewisham, located east of the town of Lewisham, and south of the town of Greenwich. It is notable for its traditional pubs, village-y feel, and extensively large green space. Blackheath was a rallying point for Wat Tyler's Peasants' Revolt of 1381, and for Jack Cade's Kentish rebellion in 1450. Wat Tyler is remembered by Wat Tyler Road on the heath, and Jack Cade by Cade Road near the heath. After pitching camp on Blackheath, Cornish rebels were defeated in the Battle of Deptford Bridge (sometimes called the Battle of Blackheath), just to the west, on 17 June 1497. 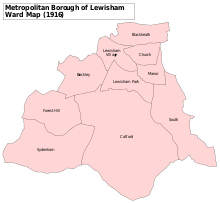 A map showing the Blackheath ward of Lewisham Metropolitan Borough as it appeared in 1916. 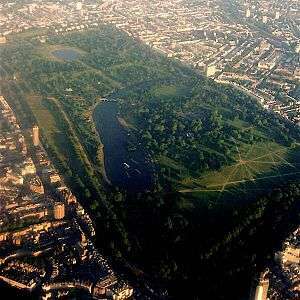 The sizeable estate of Blackheath Park, created on lands of Wricklemarsh Manor by John Cator is situated east of Blackheath. Built over in the late 18th and early 19th centuries, it contains many fine examples of substantial Georgian and Victorian houses – most notably Michael Searles' crescent of semi-detached terrace houses linked by colonnades, The Paragon (c. 1793-1807) – as well as some 1930s and 1960s additions. The Cator Estate was built on part of the estate formerly owned by Sir John Morden, whose Morden College (1695) is another notable building to the south-east of the heath. The Cator Estate also contains innovative 1960s 'Span' houses and flats by the renowned Span Developments (architect Eric Lyons), and the Blackheath High School buildings on Vanburgh Park include the Church Army Chapel. St Michael and All Angels Church, designed by local architect George Smith and completed in 1830, was dubbed the Needle of Kent in honour of its tall, thin spire (it is also nicknamed the Devil's Pick or the Devil's Toothpick). 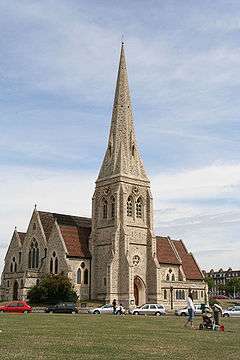 All Saints Church, situated on the heath, designed by the architect Benjamin Ferrey, dates from 1857. Another Anglican church, St John the Evangelist's, was designed in 1853 by Arthur Ashpitel. In the 18th century, Blackheath was the home of Greenwich Cricket Club and a venue for first-class cricket matches. The earliest known senior match was Kent v London on Wednesday, 5 August 1730. A contemporary newspaper report said "the Kentish champions would have lost their honours by being beat at one innings if time had permitted". It is not clear if the references to "honours" and "champions" meant that the Kent team, then managed by Edwin Stead, had claims to being the champion county. The last recorded match was Kent v London in August 1769, Kent winning by 47 runs. Cricket continued to be played on the 'Heath' but at a junior level. By 1890, London County Council was maintaining 36 pitches. Blackheath Cricket Club has been part of the sporting fabric of the area, joining forces with Blackheath Rugby Club in 1883 to purchase and develop the Rectory Field as a home ground in Charlton. Blackheath Cricket Club hosted 84 first-class Kent County matches between 1887 and 1971. However, Blackheath is perhaps most famous for founding the Blackheath Rugby Club in 1858, which is the oldest documented rugby club in England and located on Charlton Road. The Blackheath club also organised the world's first rugby international (between England and Scotland in Edinburgh on 27 March 1871) and hosted the first international between England and Wales ten years later – the players meeting and getting changed at the Princess of Wales public house. Blackheath was one of the 12 founding members of the Football Association in 1863, as well as nearby Blackheath Proprietary School and Percival House (Blackheath). Blackheath's heathland habitat was well known to early botanists – in the 18th century Carl Linnaeus is reported to have fallen to his knees to thank God when he first saw the gorse growing there (but this disputed account is more often attributed to Putney Heath). This environment supported both the flora and fauna of wild grassland. In 1859, Greenwich Natural History Society recorded a wide list of animal species, including natterjack toads, hares, common lizards, bats, quail, ring ouzel and nightingale. Today, bats are still found on Blackheath and migrating ring ouzel may occasionally be seen in spring. Ranger's House, a medium-sized red brick Georgian mansion in the Palladian style, backs directly onto Greenwich Park. Since 2002 it has housed the Wernher Collection of art. The heath is host to an annual fireworks display on the Saturday in November closest to Guy Fawkes Night. This was previously organised and financed by the London Boroughs of Greenwich and Lewisham, but Greenwich Council withdrew its share of the funding in 2010. In September 2014, the inaugural On Blackheath festival was hosted on the heath. The line-up included Massive Attack, Frank Turner, Grace Jones, Aloe Blacc and Imelda May. The festival was also held in 2015 (line-up included Elbow, Madness, Manic Street Preachers, Laura Mvula and Kelis) and 2016 (line-up included Primal Scream, Hot Chip, Belle & Sebastian, James and Squeeze). The area is served by Blackheath station with services to London Bridge, London Charing Cross, London Victoria, London Cannon Street, Slade Green via Bexleyheath, Dartford via Bexleyheath and to Gillingham via Woolwich Arsenal. ↑ "Lewisham Ward population 2011". Neighbourhood Statistics. Office for National Statistics. Retrieved 13 October 2016. 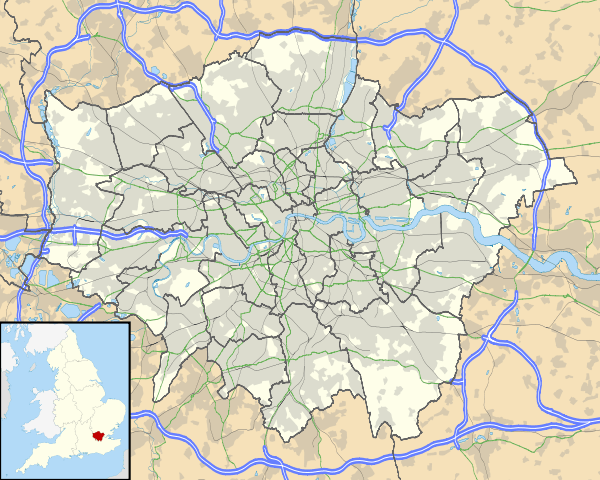 ↑ "Blackheath Westcombe Demographics (Greenwich, England)". blackheath-westcombe.localstats.co.uk. Retrieved 13 October 2016. ↑ "Area guide for Blackheath". 1 2 3 Mills, A.D. (11 March 2010). Dictionary of London Place Names. Oxford. ISBN 978-0199566785. ↑ By Elizabeth Crawford, ed. The Women's Suffrage Movement: a reference guide, 1866-1928, s.v. "Blackheath"
↑ "London Gardens Online". London Gardens Online. Retrieved 15 June 2013. ↑ "Vanbrugh Pits on Blackheath". Lewisham.gov.uk. Retrieved 15 June 2013. ↑ "Mince Pie House, Vanbrugh Fields, Blackheath, c. 1910 | Lewisham Galleries". Ideal Homes. 29 September 2010. Retrieved 15 June 2013. ↑ In 1669, Sir John Morden, 1st Baronet purchased (for £4,200) Wricklemarsh Manor; the mansion and 283 | acre | ha were sold in 1783 by Sir Gregory Page-Turner, 3rd Baronet for £22,000 to John Cator. ↑ Howard Colvin, Biographical Dictionary of British Architects, 1600-1840, 3rd ed. 1995, s.v. "Searles, Michael". ↑ Homan, Roger (1984). The Victorian Churches of Kent. Chichester: Phillimore & Co. Ltd. pp. 30–31. ISBN 0-85033-466-7. ↑ "Our History: Royal Blackheath Golf Club - The Oldest Golf Club in the world". Royalblackheath.com. Retrieved 29 August 2011. ↑ "blackheathcc.com". blackheathcc.com. Retrieved 15 August 2013. ↑ "blackheathfencing.org.uk". blackheathfencing.org.uk. Retrieved 15 August 2013. ↑ "Common Land and the Commons Act 2006". Defra. 13 November 2012. Retrieved 3 February 2013. 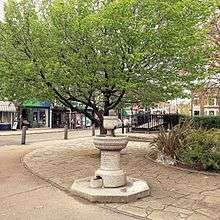 ↑ "Lewisham Council - Local parks - Blackheath". Lewisham.gov.uk. Retrieved 15 June 2013. ↑ "Blackheath - Greenwich". Royalgreenwich.gov.uk. 30 April 2012. Retrieved 15 June 2013. ↑ "Lewisham Council - Local parks - Ponds on Blackheath". Lewisham.gov.uk. Retrieved 15 June 2013. ↑ "Hare and Billet Pond". Nature Conservation Lewisham. 5 October 2012. Retrieved 15 June 2013. 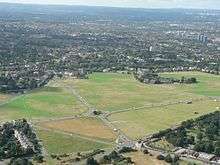 ↑ "Lewisham Council - Local Parks - Grasslands on Blackheath". Lewisham.gov.uk. Retrieved 15 June 2013. 1 2 3 "Lewisham Council - Local parks - Habitat changes and ecological decline of Blackheath". Lewisham.gov.uk. Retrieved 15 June 2013. ↑ Fries, Theodor Magnus; Jackson, Benjamin Daydon (2011). Linnaeus. Cambridge University Press. p. 158. ISBN 9781108037235. ↑ "BLACKHEATH: Greenwich Council pulls out of fireworks display". Newsshopper.co.uk. 17 September 2010. Retrieved 29 August 2011. ↑ Saturday, 13 September 2014 – Sunday, 14 September 2014, On Blackheath. Retrieved: 24 August 2015. ↑ 2015 Headliners, On Blackheath. Retrieved: 24 August 2015. Wikimedia Commons has media related to Blackheath. "Blackheath". Encyclopædia Britannica (11th ed.). 1911.